I saw the below image on pinterest and thought it was really interesting. There is SO much going on in this living room that I would think I would be overwhelmed and instantly stressed in a space with so many different wall hangings, prints and patterns and oh lordy - all those bright colors! I imagine if I had to ever to describe this room's look to someone they would think ymy taste was hideous! Antlers on the walls in different finishes, black and white damask chair, rugby striped rug layered with a zebra hide rug...it's just all wrong yet so right. Something about this room just screams effortlessly chic to me and I knew I wanted to transform it into an outfit. What do you think??? 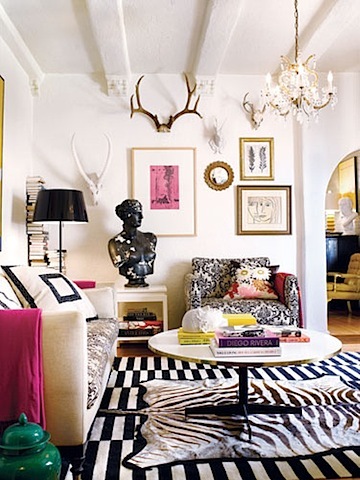 Love the zebra rug over the striped one. I would have never thought of that but it actually looks quite cool!